Both escalators and elevators were a feat of modern technology and were necessary for the creation of high rise buildings decades ago. The use of escalators and elevators are an everyday occurrence for many individuals who work in large buildings. Unfortunately, these devices will sometimes fail or experience an abrupt disruption in the service, leading to serious injuries for any current passenger. If you or a loved one were injured in an escalator or elevator accident, you may be entitled to bring a claim for damages. The number of escalator injuries has been steadily on the rise over the last 20 years, although it is scarcely reported throughout the media. In 1990, there were a reported 4,900 escalator-related injuries and deaths. However, by 2013, this number had jumped to over 12,000. Unfortunately, children and the elderly are the leading number of injuries occurring in escalator injuries. While many injuries are the result of trips and falls, others have to do with the maintenance of escalators and the escalator company, as well as the property owner. Elevator injuries are surprisingly much smaller than escalator injuries, with only approximately 10,000 injuries each year, and under 50 deaths reported each year. However, for those who are injured in elevators each year, the vast majority are not due to consumer errors, but are caused by the failure to perform annual maintenance on the elevator. Many injuries and fatalities occur to the workers who service the elevator, including falls into the shaft. Other injuries include individuals who must take the elevator every day and become trapped in the elevator for an extended period of time. In most situations, the property owner has been negligent in maintaining the elevator, leading to serious injuries. Florida is a comparative negligence state, which means that a victim’s own negligence could impact the total amount of recovery a victim may receive. In the case of an elevator or escalator accident, a court will carefully look at the facts of the case to determine whether the victim was at fault. However, the victim will still be able to recover damages even if they were 40 percent at fault for the resulting injuries. A Miami personal injury lawyer will be able to assist you in determining whether any of your own actions may impact the claim amount. The experience of being trapped in an elevator for an extended period of time is one which will often haunt an individual for months after the occurrence. The party responsible for the failure to maintain the escalator or elevator should be held responsible for their negligent behavior. 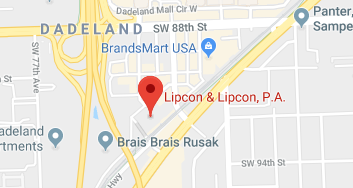 If you or a loved one were injured in an elevator or escalator accident, do not hesitate to contact the attorneys of Lipcon & Lipcon. Our attorneys are well experienced in handling personal injury claims related to escalator and elevator accidents and will work closely with you to draft a claim for damages. Contact our Miami office today for your initial free consultation.